Wary of forging any coalition govt in Karnataka after a bitter experience with JD(S), BJP leader L.K Advani today said the saffron party will prefer to remain in the Opposition rather than having a post-poll alliance if the polls threw up a hung Assembly. A Comptroller and Auditor (CAG) report has said Punjab and Haryana regions of the FCI, from where maximum quantity of food grain for the central pool are procured, did not follow instructions regarding recording of moisture content during procurement years 2004-05 and 2005-06, amounting to loss worth crores to the government. Having the nerve to speak about a reported nexus between corrupt pradhans and BSP ministers from Bundelkhand region was the reason behind ‘Gulabi Gang’, a social organisation from Banda, being branded a Naxal outfit, alleged its head Sampat Pal Devi. Defying the police warning on making provocative speeches, MNS chief Raj Thackeray today resumed his ‘war of words’ against north Indians, saying he would not allow them to “destroy” the culture of Maharashtra. The Government of India has said it would take necessary action to repatriate all Pakistani prisoners lodged in Amritsar jail once the required formalities are completed by Pakistan. The Samajwadi Party (SP) leader Amar Singh today scotched the ‘rumours’ about his party coming closer to the Congress to challenge Mayawati’s party, the BSP, in Uttar Pradesh. With the shortage of uranium, the future of the country’s nuclear programme has its hopes rested with the proven uranium deposit in the West Khasi Hills of Meghalaya. The Government of India is facing an uphill task in Meghalaya to get its people’s consent for mining the radioactive mineral. The Centre will speed up proceedings of the Wage board for Working Journalists and Non-Journalists, Union Minister of State for Parliamentary Affairs V Narayanasamy said today. Prime Minister Manmohan Singh today said the government is determined to table the Women’s Reservation Bill, in the ongoing Budget session of Parliament. The Madras High Court has ruled that teaching and non-teaching staff members of private matriculation schools are eligible for pay parity with their counterparts in government schools. Convinced of the indispensable role of traditional birth attendants (TBAs) ‘dais’, public health experts have urged the government to ensure their integration in the National Rural Health Mission (NRHM). In one of its heaviest airlifting operations, India will start transportation of five mega transformers to Kabul from tomorrow. It will be a part of the $111 million Power Grid Corp of India’s project to build the vital power transmission lines infrastructure in Afghanistan. The Indian Navy is gearing up to spread its orders for new ships among private Indian ship builders in a big way, according to sources. Bollywood megastar Amitabh Bachchan today joined Censor Board chairman Sharmila Tagore in criticising union health minister Ambumani Ramadoss’ decision to stop drinking scenes in films. The superstar wrote on his website that actors fake drinks by actually drinking diluted tea, honeyed water, aerated drink or soda water to match the colour of champagne. The screws are tightening on the Akhil Bharatiya Sena (ABS), the political party floated by gangster-turned-politician Arun Gawli. With inadequate fire safety arrangements in most of the commercial high-rise buildings and various crowded markets of Dehradun, it appears that the state capital is sitting on “powder keg”, which can burst any time. Uttarakhand Chief Minister B.C. Khanduri has announced more involvement of the locals in hydro-power generation. Dedicating the 304 MW Maneri Bhali, phase-ii project on Bhagirathi river at Dharasu, 30 km from Uttarkashi today, Khanduri said his government was against big dams and would prefer ‘run of the river’ type of projects where minimum number of locals were displaced. Gorkha Janamukti Morcha (GJM) activists today withdrew their fast-unto-death agitation following the district administration’s permission to hold a public rally here on May 7. Adopting a dramatic method to attract the Madhya Pradesh government’s attention to his constituency’s woes, Samajwadi Party MLA Kishor Samrite went to the local Upper Lake this afternoon with the intention of attaining ‘jal samadhi’. Bal Yogeshwar Sharma, a constable and a former bodyguard of Bihar Mahila Congress chief Sunita Devi, who levelled charges of sexual harassment against her has been suspended, official sources said today. Gangster Abu Salem, who was today taken to J J Hospital for a routine check up, has denied that there was any threat to his life.The state government and the Central Bureau of Investigation (CBI) had stated that Salem’s life was in danger and thus he should not be brought out of the Arthur road jail’s premises. Canadian food scientist Joseph H. Hulse will be conferred with Padma Shri by President Pratibha Devisingh Patil on Monday in the Rashtrapati Bhavan. Wary of forging any coalition government in Karnataka after a bitter experience with JD(S), BJP leader L.K Advani today said the saffron party will prefer to remain in the Opposition rather than having a post-poll alliance if the polls threw up a hung Assembly. “If we are not in a position to muster a majority by ourselves we will prefer to remain in the Opposition,” Advani told reporters, a day after he launched the party’s campaign in Karnataka. Advani ruled out any post-poll alliance with JD(S) or any other party in the event of a fractured verdict. Replying to questions, Advani suggested that the coalition experiment with the JD(S) was a mistake and that the BJP felt too betrayed to think of an alliance with that party again. Advani also cautioned against the threat of what he called the “virus of opportunism and betrayal” by Congress and JD(S) hitting Karnataka again and appealed to voters to give the saffron party ‘one chance’ by giving it a clear majority. “The virus of opportunism and betrayal by Congress and JD (S) played havoc with governance and development in Karnataka. The same virus is threatening to hit Karnataka’s politics and governance once again,” Advani told reporters. The verdict of the people in Karnataka was also crucial in the sense that it would impact national politics and influence a decision on timing of the Lok Sabha elections, he said. The Congress and JD(S) are once again working on the scenario of a hung Assembly so that they can replay the “unscrupulous role they played after 2004, just to keep the BJP out of power,” he said. The people should not let this happen, he added. “My appeal to the voters of Karnataka is straight and simple- You have so far given the Congress many chances. You have given various formations of the Janata Dal a chance. This time, give the BJP a chance,” said Advani. 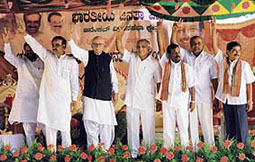 Advani said his tour of the state made him inclined to think that the people of Karnataka harboured similar views. The average percentage of storage gain accounted for by the Punjab region was only 0.93 per cent as against 2.25 per cent accounted for by the Haryana region. Meaning that the government did not get the quantity of wheat it should have as there was a short accountal of 59,898 MT valued at Rs 58.17 crore by the Punjab region as compared to Haryana. The management in its reply had stated that storage gains in the Punjab region could not be compared with the Haryana region due to heavy procurement in Punjab and the lack of storage space. However, the CAG did not find the contention acceptable. “Though the climatic conditions in both regions were similar there was a difference of nearly 200 per cent in storage gain in these regions,” it said. The FCI procures wheat for the central kitty directly, and through state governments. During storage wheat gains weight, particularly during the monsoon season, as it absorbs moisture. Due to operational constraints the FCI at times is unable to take over the entire stock procured by state agencies immediately after it is procured and the stock is stored in their godowns. For recovery of storage gain in respect of wheat stocks taken over by the FCI from the state agencies of Punjab and Haryana, the Centre in November 1999 fixed norms of storage gain at the rate of one per cent for stock recovered from covered godown and 0.70 per cent for open godown. In August 2003, on the basis of a study conducted by the Indian Grain Storage Management and Research Institute, the government fixed the criteria for accountal of storage gain at 0.70 per cent gain in weight for every one per cent increase in moisture content in respect of wheat procured, stored and issued through the FCI-owned godowns. Active in at least six districts of drought-hit Bundelkhand, the pink sari-clad lathi wielding women members of this organisation, who call themselves the “gang for justice”, have earned the wrath of the corrupt pradhans who are syphoning money coming for relief and rehabilitation work, including funds for providing drinking water and work under the National Rural Employment Guarantee Programme. Speaking to The Tribune the 45-year old fiery Sampat Pal Devi squarely blamed Gyan Singh Pradhan of Thanel village in Nareni block in Banda for instigating this retaliatory action of branding her organisation as a Naxal outfit. Reportedly close to a senior minister and close aide of the Chief Minister, the pradhan has been cornered by the distressed people of the area who are being deprived of work under the NREGP. But Sampat points out that he is not the only culprit. “Many pradhans in Bundelkhand today are the conduits through which the money pumped in the region in the name of drought relief is ending up in the pockets of the influential leaders of the area,” she alleges. “As we believe in ‘jis ki ladai, usi ki aguwai’ (let the exploited lead the struggle), thousands of women wearing their pink (gulabi) saris have been demanding accountability from such corrupt pradhans in open meetings in the villages causing much grief to them,” claimed Sampat. Two days ago none else than the state’s DGP Vikram Singh had suspected the antecedents of the ‘Gulabi Gang’. He had issued instructions to the Banda SP to prepare a profile of the organisation focusing on its real agenda and source of funding. The DGP’s statement caused much awkwardness in the Chief Minister’s office forcing it to do some damage control. The very next day ADG Law and Order Brijlal declared that ‘Gulabi Gang’ was indeed a social organisation working on women’s rights. But despite the ADG giving her organisation a clean chit, on April 30 two SOs from the police stations of Badausa and Attara of Nareni visited Sampat’s house in Attara village to interrogate her regarding the source of funds. The organisation has been active in at least six districts of Bundelkhand since 2003 but in 2006 Sampat Pal reinvented it by giving it a new identity. She motivated her members to invest Rs 100 each to buy identical shocking pink saris and since then it has been known as the forceful ‘Gulabi Gang’ inviting much media glare. Since its inception, when it started off as a registered society called Adivasi Mahila Utthan Gramudyog Seva Sansthan, it has been taking up issues relating to violence against women, livelihood and even untouchability. Daring the government to arrest him, Raj said only Maharashtra Day should be celebrated in Maharashtra. “Let the government arrest me if it wants. I am not afraid. I maintain my stand that only Maharashtra Day should be celebrated in Maharashtra,” he told a rally here to mark MNS’ second anniversary. Justifying what he said about Amitabh Bachchan, he took a swipe at Jaya Bachchan for her comments on him (Raj) and scoffed at railway minister Lalu Prasad Yadav. Raj ostensibly was mocking at Jaya for her comments at a press conference in which she had said the only Thackeray whom she knew was Shiv Sena Bal Thackeray. Meanwhile, Raj Thackeray today continued to target Amitabh Bachchan and his family but at the same time paid tributes to the actor as a “great artiste”. “Didn’t Bachchan contest his first election from Uttar Pradesh? Didn’t he become UP’s brand ambassador? When he acted in a non-Hindi film for the first time, was not it a Bhojpuri movie? Didn’t he start a girl’s school in Aishwarya’s name in UP?” Raj asked the audience at a public meeting here this evening. He said the MNS had no role in the bottle-hurling incident at Bachchan’s residence here. “My men did not do that. Had they done it, they would have thrown not a single bottle but a whole crate,” said Raj. An exercise undertaken by the Ministry of Home Affairs has revealed that there are 43 Pakistani nationals, who are interned in Amritsar. Of these, 15 have already been given consular access by India and Pakistan is yet to confirm the status of their nationality, the government has said. Stating these details in a recent communication on the subject to Avinash Rai Khanna, BJP MP in the Lok Sabha, union minister for external affairs Pranab Mukherjee said the process of granting consular access to the remaining 28 Pakistani nationals in Amritsar jail is also underway. “Once Pakistan confirms the nationality status of all 43 nationals in Amritsar, necessary action will be taken for their repatriation to Pakistan,” the external affairs minister said in his letter to Khanna, who earlier sought to know from the government the current status of Pakistani nationals lodged at the high security Amritsar Central Jail. Khanna’s letter, dated March 7 this year, was written in the wake of release of Kashmir Singh, the Indian, who languished on death row in Lahore Central Jail for 35 years, before being released this year. Khanna on the Indian side and Ansar Burney on the Pakistani side aided Singh’s release by tracing his antecedents and finally confirming his Indian nationality. Following a tip off from his Pakistani counterpart, Khanna located Singh’s family to Nangalchouran village in his constituency of Hoshiarpur. The village is in Garhshankar sub-district. Both Khanna and Burney are now working for the repatriation of Indian and Pakistani nationals lodged in the jails across the borders; they are also involved in the case of Sarabjit Singh, another Indian on death row in Pakistan. “My letter was an exercise in that direction. Amritsar Central Jail perhaps has the highest number of Pakistani nationals, who have completed their sentence. Our interest is that justice must be done. The Indian government has said it is in the process of granting consular access to all Pakistani prisoners there. Further action would be initiated subject to confirmation of prisoners’ nationality by Pakistan. We can play an active role in that sphere,” Khanna told The Tribune today. As of now, the Indian jails have 133 Pakistani prisoners and 14 Pakistani fishermen. Pakistani jails, on the other hand, have 436 Indian fishermen and 53 prisoners. Talking to newsmen here, the SP leader said, “We are not joining hands with Congress and will remain firmly with the United National Progressive Alliance (UNPA). It is a fact that the Congress, which has a feeble presence in Uttar Pradesh has found the SP a lesser evil than the Mayawati regime but that does not mean that we are coming closer to them. This is nothing but a rumour”. The ‘rumour’ stems from the developments that have taken place between the Congress and the SP in Karnataka, where the Congress has decided to withdraw its candidate against the BJP’s Chief Ministerial candidate B.S. Yeddyurappa to ensure his direct contest with former Chief Minister S. Bangarappa, an SP candidate. The SP leader didn’t lose the opportunity to take a dig at the Nationalist Congress Party (NCP) supremo Sharad Pawar terming him a ‘3D politician’. “You have heard of 3D (three dimensional) films. But Pawar is a 3D politician. In New Delhi, he is with the UPA and the Congress. In Maharashtra, he is with the Shiv Sena and in Meghalaya he is with the BJP. This is just amazing. No one and no party can achieve that feat” said. Singh. “Pawar is a great three dimensional politician. The UPA’s agricultural and civil aviation minister was campaigning with the BJP for Meghalaya Assembly polls. But still everybody asks whether the SP and the Congress have any alliance. This is unfair”. Regarding the controversy surrounding the ‘citizenship’ of Congress MP from Assam, Mani Kumar Subba, the SP leader today called for an explanation from the Prime Minister Dr Manmohan Singh given that the CBI, which told the Supreme Court that Subba had presented fake citizenship documents before the Election Commission, is part of the Personnel Department that is now under the PMO. With the shortage of uranium, the future of the country’s nuclear programme has its hopes rested with the proven uranium deposit in the West Khasi Hills of Meghalaya. The Government of India is facing an uphill task in Meghalaya to get its people’s consent for mining the radioactive mineral. Union minister of state for power Jairam Ramesh said today, “India’s nuclear programme depends heavily on the uranium deposits in Meghalaya. The Department Of Atomic Energy (DAE), the Uranium Corporation of India Limited (UCIL) are now faced with a huge challenge to convince the people of Meghalaya and its government to allow extraction of the radioactive mineral. “Uranium mining in Meghalaya is a matter of life and death for India’s nuclear programme. However, uranium would be mined only if we have the consent of the local people and approval of the state government,” Ramesh said. According to Ramesh, most of the nuclear reactors in the country were running at 50 per cent of the total capacity because of the shortage of uranium, which forced the UPA to vie for the nuclear deal with the USA. Meanwhile, the Meghalaya government had sought a nuclear power plant either in Meghalaya or any other suitable part of the northeast India as a pre-condition for uranium mining in Meghalaya, provided there was no health or environment hazards of the mining process. Ramesh held a meeting with Meghalaya Chief Minister Donkupar Roy and Deputy Chief Minister Hoping Stone Lyngdog with the participation of chairman of the Atomic Energy Commission Kakodkar over mobile phone in Shillong yesterday. He said today that Meghalaya government’s request for a nuclear power plant had been conveyed to the DAE. He said Kakodkar had agreed to set up an expert committee to carry out techno-economic feasibility study for a nuclear power plant in Meghalaya or any other part of the northeast. The DAE would also prepare a White Paper by May 31 on the proposed uranium mining in Meghalaya, giving a detail account of the safeguards to be provided to the locals in response to the apprehensions about health, environment hazards of uranium extraction as well as the benefits that would be derived by the local people and the state government. The White Paper would be given to the Meghalaya government for discussion in the state assembly and would be thrown open for public debate. Having set up the wageboard, the UPA government will ensure that the proceedings are speeded up, he said when his attention was drawn to a petition filed by an English daily in Delhi challenging the constitution of the Justice Narayana Kurup Wage Board and seeking an interim stay on their proceedings. “I will personally take up the matter with the Information and Broadcasting Minister Priyaranjan Dasmunshi,” he told a meet-the-press, organised by the Calicut Press Club here. Admitting a petition, a Division Bench of the Delhi High Court on Wednesday last issued notices to the Centre, returnable on May 13. Meanwhile, unhappy over postponement of the meeting of the wage board for media organisations, the Confederation of Newspaper and New Agency Employees Organisations today said it would seek the intervention of top leaders, including Prime Minister Manmohan Singh. The confederation at its meeting criticised the decision of wage board chairman Justice K Narayan Kurup to postpone the meeting and decided that it would seek the intervention of the Prime Minister, Congress President Sonia Gandhi, Labour Minister Oscar Fernandes and Leader of Opposition L K Advani. “We will meet the Prime Minister, Sonia Gandhi and other leaders in the next couple of days and urge them to intervene in the matter,” said M S Yadav, general secretary of the confederation. He asked why after a petition by a newspaper, without any order for postponement by the Delhi High Court, the meeting of the wage board was put off. While hailing the government’s sincerity of purpose in the matter, the Communist Party of India observed that the Manmohan Singh government had already begun clearing files and was keen on fulfilling the long standing demand for a legislation that sought to provide 33 per cent reservation for women in Parliament and state assemblies. CPI general secretary A.B. Bardhan, who led the three-member delegation, to demand disbanding of the Salwa Judum (the anti- Naxal militia) in Chhattisgarh, told The Tribune that the Prime Minister made this assurance on being asked about the status of the Women’s Reservation Bill. “The PM said he had called a meeting of the Cabinet on Monday to work out modalities to introduce the Bill,” Bardhan said. The PM’s decision to hold a meeting of the Cabinet, four days ahead of its usual mid-week schedule, is an indication of the government’ earnestness to introduce the Bill. Although the government is rushing into a pro-active mode on the Women’s Reservation Bill, in the past five days of the session concluding on May 9, the CPI does not doubt its good intentions. A senior CPI leader said the PM returned an affirmative on being asked if he was clearing the files. Amidst apprehensions that it may not return to power in the general elections in the coming year, the Congress-led UPA government wants to take time by the forelock of tabling the Women’s Reservation Bill. CPI MP Gurudas Dasgupta said even if the Bill was tabled in Parliament, it would be recognition of the fact that this was a case for reservation for women. “It will be the beginning of a positive process. The subsequent Lok Sabha will take it up”, Dasgupta said the Left had a common perspective and a common strategy on the Bill and will support it fully when it is tabled. Apart from consistent pressure from women organisations, the Congress-led UPA government has been facing tremendous pressure from various quarters to pass the Bill. The BJP led Opposition has accused the government of failing to honour its commitment on the Bill even when it features in the UPA’s Common Minimum Programme. Women Congress MPs led by Mahilla Congress Chief Prabha Thakur, called on the PM last week and submitted a memorandum, for speedy passage of the Bill. In March this year, the PM promised a women delegation that he would call an all-party meeting to build a consensus on the issue. Passing orders on a batch of writ petitions and appeals from teachers, school managements and various associations, a Division Bench, comprising Justices Elipe Dharma Rao and S Palanivelu, said it was a judicially settled issue that matriculation school teachers were entitled to get pay on par with teachers working in government schools. Decrying private school managements for citing their poor financial health to deny pay benefits to teachers, the Bench said the school authorities must honour the undertaking they had given to the government while seeking recognition for their institutions. ''It is to be borne in mind that while getting recognition from the government, the matriculation school authorities have given an undertaking that they would abide by the guidelines formulated by the government in the matter of payment of salary to their staff,'' it noted. The private school teachers submitted in their petitions that every matriculation school got recognition under the Code of Regulation for Matriculation Schools of Tamil Nadu. The code made it mandatory to implement Regulation 16, which stated that teaching and non-teaching staff of matriculation schools should be paid at least government scale of pay. The managements contended that the schools did not receive any state aid and hence, it was not possible for them to match the salary paid by the government. If the pay scales as fixed by the government were applied to self-financing schools, the institutions have to be closed down, they said. The director of school education told the court that as per Chapter V, in proviso 16 (ii) of the Code of Matriculation Schools, teaching and non-teaching staff in matriculation schools should be paid salary at least on par with the government pay scales. The NRHM, launched in 2005, is the leading government health programme in the country. At a two-day consultation on the role of the TBAs in the NRHM, the experts voiced concern over the abrupt manner in which thousands of trained and much trusted TBAs were being excluded and devalued in preference to overrated institutional deliveries promoted by accredited social health activists (ASHAs). They pointed out that the traditional birth attendant training was promoted in the non-Western world, including India, from 1970 to 2000 till policy makers suddenly decided to focus on skilled birth attendants. Manisha Malhotra, assistant commissioner, Ministry of Health, however, defended the ministry by contending that the NRHM had neither ignored nor disowned the ‘dais’. She said the ministry had a meeting in December 2007 to review the role of ‘dais’. Holding a mirror to the Ministry of Health and Family Welfare, the experts and grassroot workers said deficiencies in infrastructure in the public health system were defeating the very purpose of the NRHM service delivery paradigm. Although the NRHM seeks to promote institutional delivery to ensure emergency obstetric services and safe birth outcomes, there are increasing reports of poor quality of care leading to life-threatening complications for women. Considering the future role of the TBAs, experts pleaded the case of 1 million ‘dais’ in the country, who merit recognition for reaching out to poor women at their doorstep for negligible monetary returns. Dr Abhijit Das, director of the Centre for Health and Social Justice, a non-government organisation, says that while the ‘dais’ are continuing to provide support to millions of would-be mothers, they are not getting any recognition or remuneration. Three lighter 40 MVA transformers would be airlifted by the Indian Air Force’s AN-124 planes on May 4, 5 and 7. The remaining two heavier transformers would be airlifted later this month. India is supplementing the efforts of the World Bank and some European countries to bring power to electricity starved Afghanistan from Central Asia. In this project, role of India is to lay transmission lines and set up power sub-station in the Afghan capital. India is engaged in laying a double-circuit transmission line from Pul-e-Khurmi to Kabul and constructing a 220 KV sub-station in Kabul. The transformers are meant for a sub-station in the Afghan capital, which is a part of the power transmission project that India has undertaken. The Indian part of the work is expected to be over by October 2008. The task of Indians in Afghanistan is extremely difficult, as they have to operate in hostile environment. Constant threats from the Taliban and Al-Qaida elements too looms large over their movements and operations. The terrorists have already targeted and killed several Indian workers in Afghanistan. To complicate matters further, the Pakistan government has consistently refused to play ball and rejected New Delhi’s requests for land transit rights to reach out to Afghanistan. For reasons of security and prompt delivery, India is constrained to transport the heavy power transformers by air instead of the less expensive road or sea routes. So far, only the government-owned shipbuilding companies like Mazgaon Docks and Garden Reach Shipyard were entrusted with building warships for the Indian Navy. However, this is all set to change with some of the biggest Indian engineering companies entering the fray to build ships for the Indian Navy. Sources here say as much as Rs 8,000 crore worth of shipbuilding orders will be up for grabs in the next couple of years and a large number of players are expected to bid aggressively for the jobs. “So far a handful of shipbuilding companies like Bharati Shipyard and ABG Shipyard have been involved with work related to the Indian Navy, but the number will go up soon,” a naval source informed. With the defence ministry expected to make big-ticket purchases across the board in the coming years, plenty of opportunities are likely to open up for Indian companies. As per the new norm adopted by the government, foreign suppliers will have to comply with the off-set clause in purchases. Ingenieurtechnik und Maschinenbau of Germany is to develop a master plan and design for the shipyard. L&T may also tie up with a Japanese or South Korean shipyard as a technology partner for the venture. Punj Lloyd is also in the shipbuilding venture thanks to its holding in the Pipavav Shipyard of Gujarat. The company is angling for orders worth Rs 2,000 crore annually from the Indian Navy by building frigates and carrying out maintenance work for India’s aircraft carrier, according to information put out by Punj Lloyd. According to the company, the Pipavav Shipyard offers dry docking facilities, which would allow repair and maintenance of large ships like aircraft carrier INS Viraat. Existing suppliers to the Navy like ABG Shipyard and Bharati Shipyard are also upgrading their facilities to bid for bigger orders from the defence sector. “That’s what we are actually drinking on the sets to simulate the whisky. Our intoxication, minister, is in the credibility we bring to a drunken scene without being literally drunk, not to propagate alcoholism,” Bachchan remarked on his blog. “Now the health minister, Ramadoss, is asking film stars to stop drinking scenes in their films. “First the smoking scenes, and now drinking. Hola!! What next?,” he wondered. “I shield myself behind the pages of our revered Constitution and law and the Censor Board. Bring in a law to ban such participation and we shall follow it diligently Mr Minister,” the actor said. Days after Gawli was arrested under the tough Maharashtra Control of Organised Crime Act for allegedly extorting money from builders, the Mumbai police is tightening the screws on the office-bearers of the ABS. The police said today that a lookout notice had been posted to arrest Surendra Gagan, alias Sandy, who holds the post of secretary in the ABS. According to the police, Sandy was among others who allegedly murdered Kamlakar Jamsandikar, a corporator of the Shiv Sena in the Brihanmumbai Municipal Corporation, in March last year. Initially, the police had said Jamsandikar was killed due to political rivalry with the ABS in the working class Saki Naka neighbourhood. However, the police now says Jamsandikar’s murder was a contract killing carried out by the Gawli gang. “Jamsandikar was killed at the behest of former Shiv Sena leader and mentor Sahebrao Bintode,” Joint Commissioner of Police Rakesh Maria told reporters. According to the police officer, Bintode wanted a plot owned by Jamsandikar for constructing a building, but the latter refused to give up the plot. Jamsandikar then managed to obtain the Shiv Sena ticket for the Saki Naka BMC seat represented by Bintode, thereby further sealing his fate. The police says Gagan and some other office-bearers of the ABS were present at the Gawli’s residence where the deal to bump off Jamsandikar was struck. Though fire officials claim that they keep making checks to ensure that all buildings comply with fire safety norms but inquiries made by The Tribune revealed that majority of the building have “no arrangements”, whatsoever, to tackle a fire exigency. As per the National Buildings Code (NBC) all high-rise, institutional, business, public assembly, storage and industrial buildings should have a minimum basic in-built fire-protection and fire-fighting equipment. Besides, in wake of the fact that Uttarakhand Fire Service is expected to come into force in sometime, commercial buildings other than a high-rise, are supposed to follow the Uttar Pradesh Fire Service Act, 1944. But unfortunately, so far little heed has been paid to ensure implementation of the above mentioned fire safety rules. The people living in vicinity of Industrial area are also under constant threat and great danger, on account of no fire safety measures being adopted by industrial units. Besides, there are several industrial units, which do not even have water storage facility in case it is needed if a fir breaks out. Uttarakhand Chief Minister B.C. Khanduri has announced more involvement of the locals in hydro-power generation. Dedicating the 304 MW Maneri Bhali, phase-ii project on Bhagirathi river at Dharasu, 30 km from Uttarkashi today, Khanduri said his government was against big dams and would prefer ‘run of the river’ type of projects where minimum number of locals were displaced. “Instead of big dams, water can be diverted through tunnels to produce power,” he said. Khanduri reiterated his commitment to give more employment opportunities to locals in the power sector. “We have formulated a new power policy where power projects up to 25 MW could be taken up by the locals for generation and maintenance,” he said. However, he regretted that despite blessed with abundant water resources, the people of the state were not being benefited. He claimed that his government was taking several initiatives so that natural resources could be utilised for the betterment of the people. The Chief Minister said to make Uttarakhand a ‘power surplus state’, an additional capacity of 1,000 MW was being created in the near future. The construction work of 480 MW Pala Maneri power project, 120 MW Vyasi project, new small power projects of 250 MW and renewal and modernisation of 150 MW old projects was in full swing. Divisional commissioner B.L. Meena gave the permission on behalf of the West Bengal government. SDO Smitha Pandey sustained minor injuries, when the GJM activists hurled bricks at the police and Darjeeling administrative staff in Dagapur after they were not allowed to begin their hunger strike at Darjeeling crossing earlier today. GJM general secretary Roshan Giri said they would stick to their demand for a separate Gorkhaland. “We had orders to stall them until the permission was granted. But the Morcha activists were not ready to wait. They turned violent and began hurling stones and bricks at us,” he added. However, after they were granted permission, they calmed down and began their scheduled fast-unto-death on the third day of their agitation. 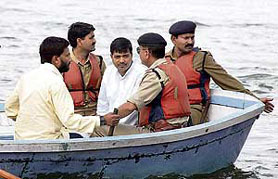 Samrite, who represents Balaghat district’s Naxalism-affected Lanji, took a small boat to the deep area. The police and other administrative officials reached the legislator and dissuaded him from taking a plunge. “The regime is paying no heed to Lanji despite my having penned dozens of letters to the Chief Minister (Shivraj Singh Chouhan) and officials over the past four to five months. I decided to attain ‘jal samadhi’ as the problems were unsolved,” the MLA told reporters. Samrite submitted to the administration, a 11-point charter of demands addressed to the Chief Minister and the legislator would take the “next step” if the problems were unsolved. He did not say what the “step” would be. “The matter is under scrutiny and legal action will be taken. The bodyguard has been suspended and an inquiry ordered into his conduct after Sunita Devi charged Sharma with playing into the hands of her rivals who wanted to tarnish her image,” the sources said. Sharma is currently posted in the Vigilance Department of the State Electricity Board at Ara. Taking a serious view of the allegations, state Congress president Sadanand Singh constituted a three-member committee to hold an impartial inquiry. The committee, headed by former MLA Narendra Kumar, will have party spokesman H K Verma and General Secretary Jamal Ahmad Bhallu as its members, party sources said. Salem was taken to the hospital after he complained of severe backache two days ago. Earlier, the state government had restrained Salem’s movements outside the Arthur Road prison, following threats to his life. Hulse, who was vice-president of the Canada’s International Development Centre (IDRC), is a biochemist by profession and has done research on food, nutrition and food security. Hulse, visited India in 1962 to offer Canadian cooperation for the establishment of the International Food Technology Training Centre in Mysore. In the next 40 years, he travelled to India over 60 times for various projects.